Valeant is now attacking its attackers. The embattled drug maker launched a full-scale assault on Monday against allegations it's committed Enron-like fraud. More than a dozen senior Valeant (VRX) executives and directors held a 75-minute conference call aimed at stopping the panic caused by short seller Andrew Left and his firm Citron Research. Left's allegations of massive fraud have wiped out a stunning $11 billion from Valeant's market value just in three trading days. Valeant Chairman and CEO J. Michael Pearson called Left's charges "completely untrue." He said the short seller was the market equivalent of a person who shouts "fire" in a crowded theater. "He wanted people to run. He intentionally designed the report to frighten our shareholders to drive down the price of the stock so he could make money," Pearson told analysts. When the Citron report was released, "all hell broke loose," Pearson said. Short sellers like Left bet against a stock and profit when the price falls. It's a strategy that has helped Left build a fortune by betting against other big companies. Valeant said its lawyers have met with the Securities and Exchange Commission to request the agency investigate Left and Citron. The SEC declined to comment on the matter. Left told CNNMoney that when people smell smoke in a crowded theater, they have a "duty" to alert others. "Now the information is out, people have had an opportunity to inspect the theater and they have chosen to leave...Maybe there is fire," Left said in an email. Valeant declined to comment to CNNMoney about whether or not the company plans to sue Left. The short seller said he has not been sued by Valeant yet. Left said he has been sued by previous targets of his negative campaigns and that he's never lost such a suit. Valeant shares have plummeted roughly 25% since Left published his report on October 21 accusing the drug maker of an Enron-like web of deception by creating phony pharmacies that fraudulently book revenues and deceive auditors. He called into question Valeant's complex relationship with a specialty pharmacy called Philidor. 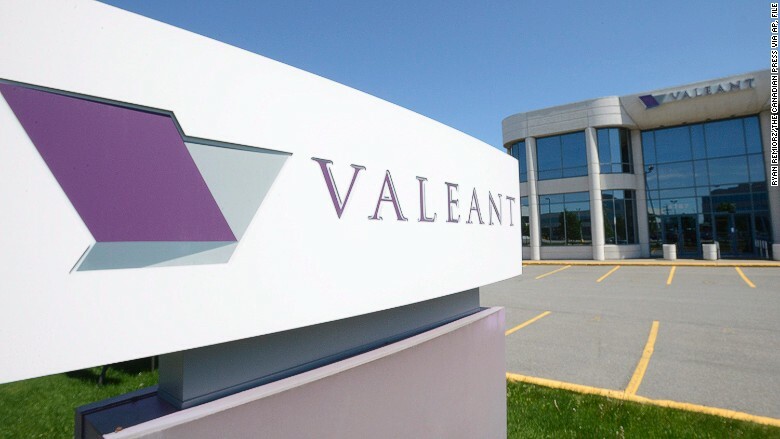 Valeant management denied the allegations and the company's board announced on Monday it is launching an ad hoc committee to review the charges. The board has hired its own lawyers. Valeant said it believes the company is "in compliance with applicable law." So far, its board and audit and risk committee also say they stand behind the "appropriateness" of the company's accounting practices related to Philidor. Robert Ingram, Valeant's lead outside director, said the board has "complete confidence" in Pearson and "fully supported" the company's specialty pharmacy strategy. Valeant's efforts to quell the controversy seem to be getting mixed results. The company's volatile shares were neutral around midday. Spider-Man alias used by Valeant workers? Valeant was dealt another blow over the weekend after The Wall Street Journal raised further questions over the murky relationship between Valeant and Philidor. The paper reported on how several workers at Philidor used aliases in their emails. One worker, Bijal Patel, used the email alias of "Peter Parker," the alter ego of Spider-Man, the Journal reported. Ultimately they were all employed by Valeant. Valeant said it takes the claims "seriously" and they will be reviewed by the newly-formed committee. Valeant conceded it is considering all options at this point, including potentially severing its ties to Philidor. Valeant said it paid $100 million for an option to acquire Philidor in December 2014, though the company remains an independent entity at this point.